Dr. Murali-Krishna Kaja received his Ph.D. from Indian Institute of Science in 1995. His graduate work focused on protective immunity to Japanese Encephalitis Virus. Following this, he received post-doctoral training at the laboratory of Dr. Rafi Ahmed at the Emory University. During this time he studied dynamics of immune responses to infection, mechanisms of T cell memory generation and maintenance requirements, and published some of the most highly cited papers that moved the field forward. Following this he spent a brief period at Emory University as Assistant Professor in the Department of Microbiology and Immunology followed by extension of his studies as a faculty at the Department of Immunology, University of Washington, Seattle and the Washington National Primate Center, during which he served there as assistant professor, core staff and associate professor. In 2011 Dr kaja joined Emory University as an Associate Professor of Pediatrics, Division of Infectious Diseases and the Emory Vaccine Center. 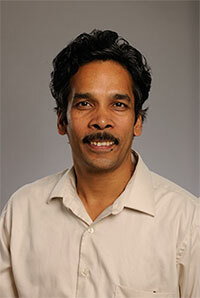 He is also director for the Joint Emory:ICGEB Center for translational human immunology program in India. 7)Sub-optimal immune responses in infants, elderly and immunocompromized. 1. Murali-Krishna K, Ravi V, Manjunath R. Cytotoxic T lymphocytes raised against Japanese encephalitis virus: effector cell phenotype, target specificity and in vitro virus clearance. J Gen Virol. 1994 Apr;75 ( Pt 4):799-807. PubMed PMID: 8151296. 2. Murali-Krishna K, Ramireddy B, Ravi V, Manjunath R. Recognition of nonstructural protein peptides by cytotoxic T lymphocytes raised against Japanese encephalitis virus. MicrobiolImmunol. 1995;39(12):1021-24. PubMed PMID: 8789064. 3. Murali-Krishna K, Ravi V, Manjunath R. Protection of adult but not newborn mice against lethal intracerebral challenge with Japanese encephalitis virus by adoptively transferred virus-specific cytotoxic T lymphocytes: requirement for L3T4+ T cells.J Gen Virol. 1996 Apr;77 ( Pt 4):705-14. PubMed PMID: 8627259. 4. Murali-Krishna K, Lau LL, Sambhara S, Lemonnier F, Altman J, Ahmed R. Persistence of memory CD8 T cells in MHC class I-deficient mice. Science. 1999 Nov 12;286(5443):1377-81. PubMed PMID: 10558996. 5. Murali-Krishna K, Altman JD, Suresh M, Sourdive DJ, Zajac AJ, Miller JD, Slansky J, Ahmed R. Counting antigen-specific CD8 T cells: a reevaluation of bystander activation during viral infection. Immunity. 1998 Feb;8(2):177-87. PubMed PMID: 9491999. 6. Becker TC, Wherry EJ, Boone D, Murali-Krishna K, Antia R, Ma A, Ahmed R. Interleukin 15 is required for proliferative renewal of virus-specific memory CD8 T cells. J Exp Med. 2002 Jun 17;195(12):1541-8. PubMed PMID: 12070282; PubMed Central PMCID: PMC2193552. 7. Murali-Krishna K, Ahmed R. Cutting edge: naive T cells masquerading as memory cells. J Immunol. 2000 Aug 15;165(4):1733-7. PubMed PMID: 10925249. 8. Kolumam GA, Thomas S, Thompson LJ, Sprent J, Murali-Krishna K. Type I interferons act directly on CD8 T cells to allow clonal expansion and memory formation in response to viral infection. J Exp Med. 2005 Sep 5;202(5):637-50. Epub 2005 Aug 29. PubMed PMID: 16129706; PubMed Central PMCID: PMC2212878. 9. Havenar-Daughton C, Kolumam GA, Murali-Krishna K. Cutting Edge: The direct action of type I IFN on CD4 T cells is critical for sustaining clonal expansion in response to a viral but not a bacterial infection. J Immunol. 2006 Mar 15;176(6):3315-9. PubMed PMID: 16517698.
. 11. Kulkarni RR, Rasheed MA, Bhaumik SK, Ranjan P, Cao W, Davis C, Marisetti K, Thomas S, Gangappa S, Sambhara S, Murali-Krishna K. Activation of the RIG-I pathway during influenza vaccination enhances the germinal center reaction, promotes T follicular helper cell induction, and provides a dose-sparing effect and protective immunity. J Virol. 2014 Dec;88(24):13990-4001. doi: 10.1128/JVI.02273-14. Epub 2014 Sep 24. PubMed PMID: 25253340; PubMed Central PMCID: PMC4249139.